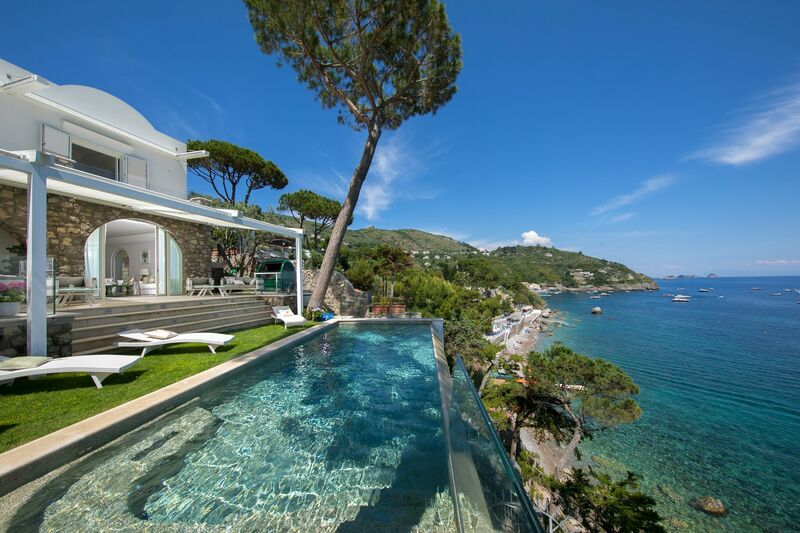 Villa Nereide is a splendid multi-story luxury villa overlooking the sea, surrounded by spacious terraces. 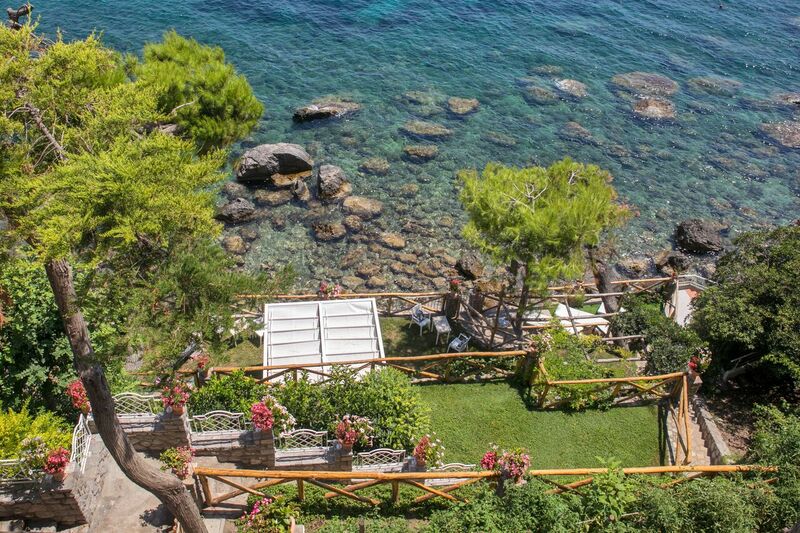 The outdoor infinity swimming pool, featuring hydro-massage seats, is framed by two ancient maritime pines and surrounded by the fragrance of the flower-filled garden, is the perfect place to relax. 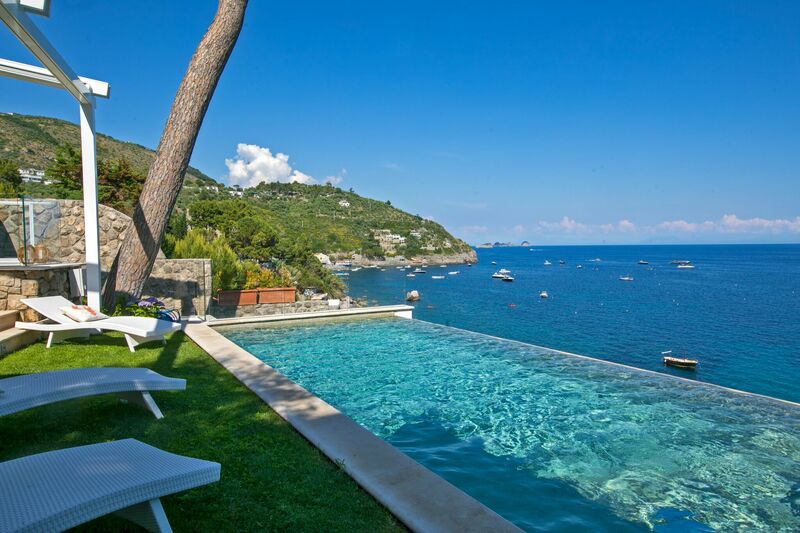 The panoramic villa offers breathtaking views of Marina Del Cantone and the Galli islands in front. 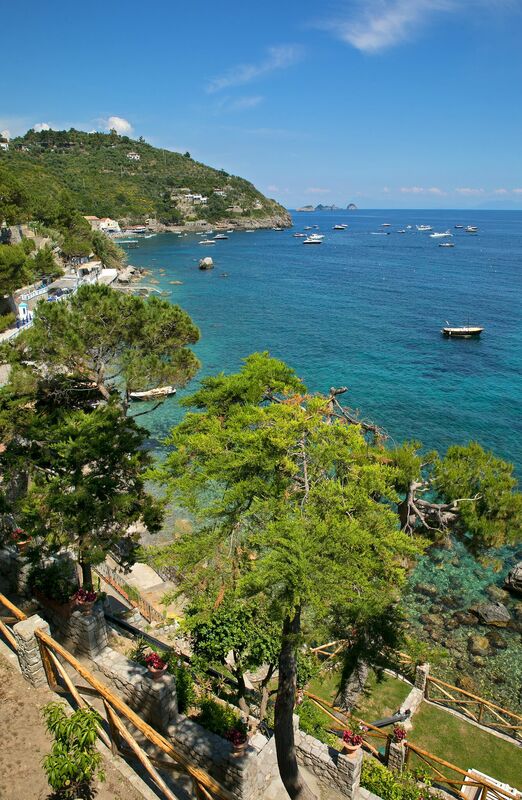 The villa and its external areas are laid out over several floors, connected by elevators/lifts or stairs and the garden boasts various terraces down to the sea, reachable either by a private walkway or by the private cable car, called a ‘funiculare’ which is for exclusive use to the guests staying at the property. The four bedrooms and spacious living room are furnished with elegance and style, carefully detailed to create a luxurious harmony. 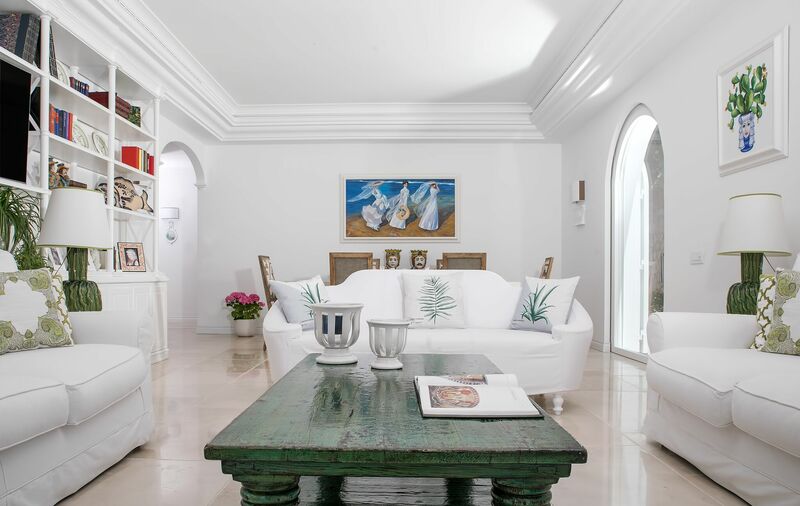 The property can be reached directly from the convenient parking area (boasting 2 parking spaces) and entrance gate by private lift or by an external stone staircase of 30 steps. 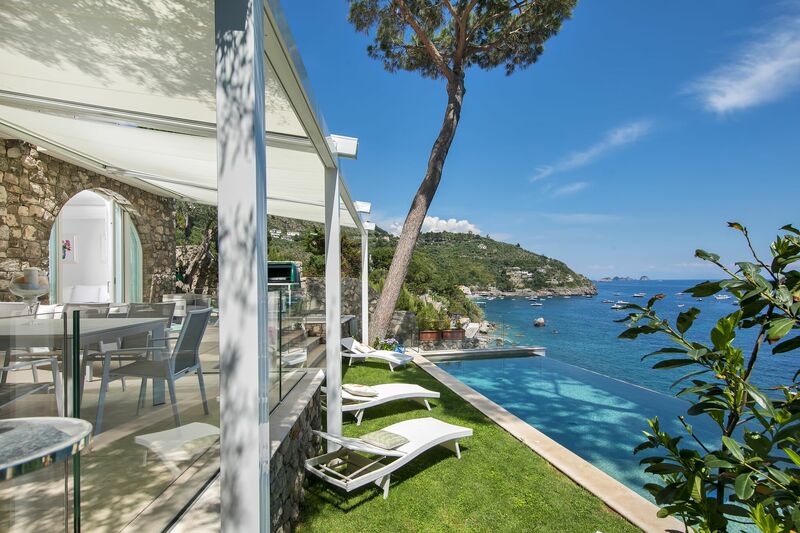 Villa Nereide has air conditioning and an innovative diffusion system for its cooling and heating, and WI-FI. The outdoor area is a 140 sq. meter terrace surrounding the villa. 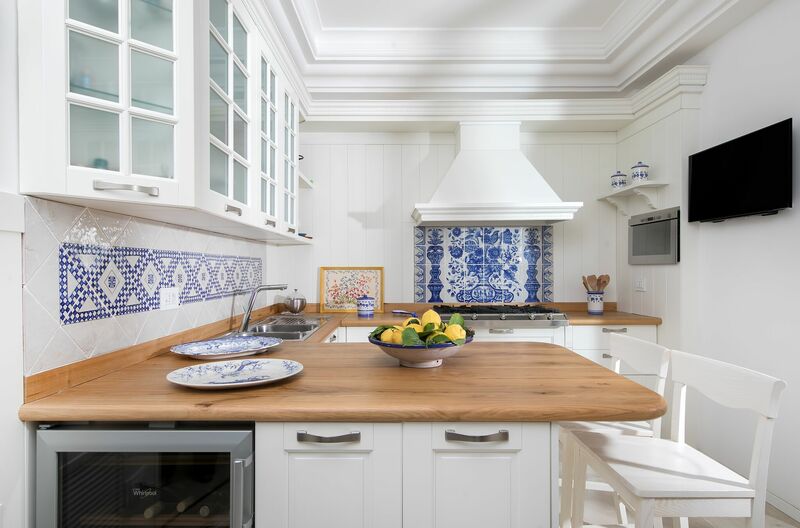 It enjoys an outdoor living and dining area with a grand table under a century old olive tree, a brickwork barbecue a wood-fire pizza oven and is embellished with plenty of flowerbeds. 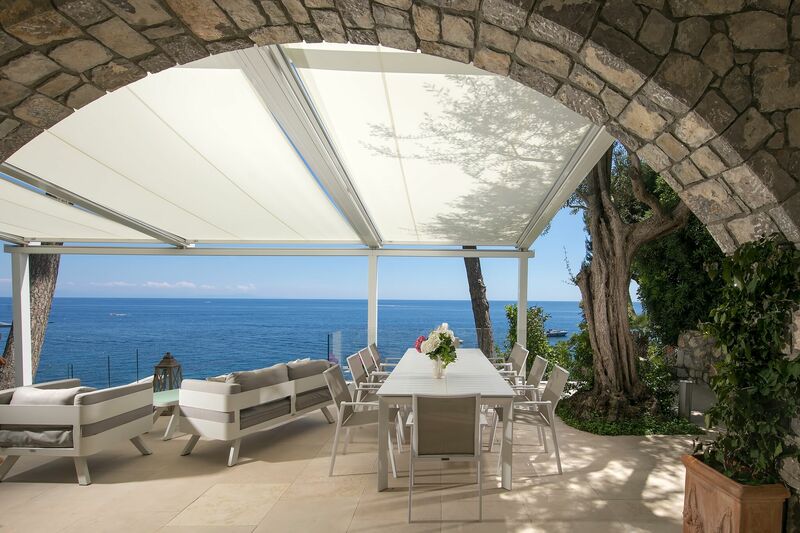 Drapes completes the area creating the cosy atmosphere of a comfortable patio. The living room is a spacious and bright ambience with an open piece of furniture containing a 55” Satellite TV. 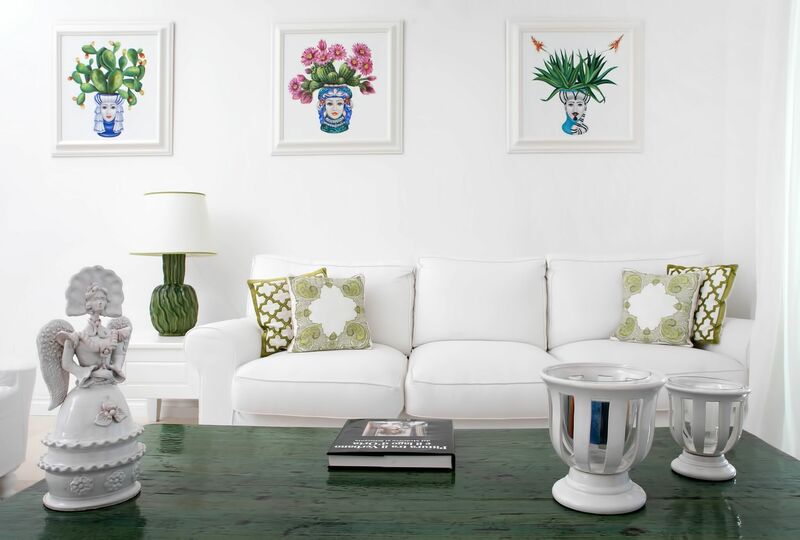 It is furnished with three elegant sofas and there is a dining area with a large table. The lounge, which extends directly on to the panoramic terrace patio in front of the swimming pool, has both air conditioning and heating. 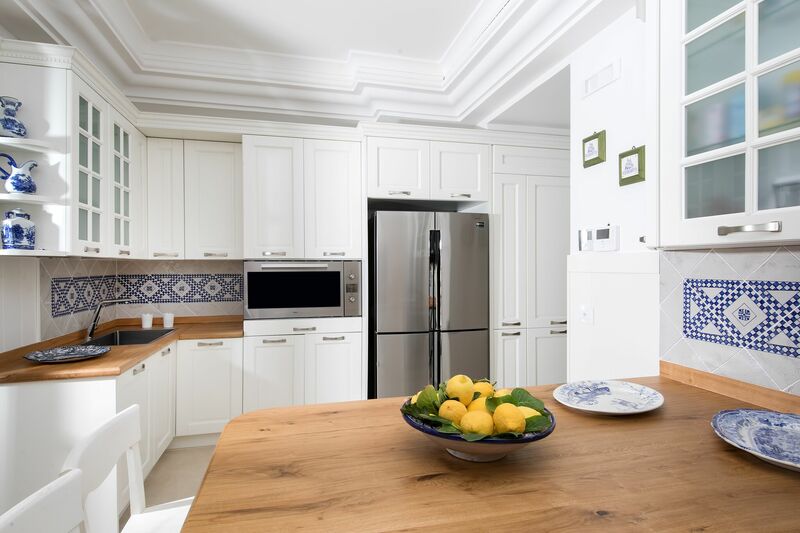 The kitchen has four gas stoves, an electric oven, a microwave, a fridge/freezer, wine cooler, ice machine, dishwasher, moka pot, American coffee-maker, toaster, electric kettle and other small domestic appliances as well as air conditioning and heating. It is also possible to access the terrace from the kitchen. The ground floor has the first bedroom with en suite bathroom. 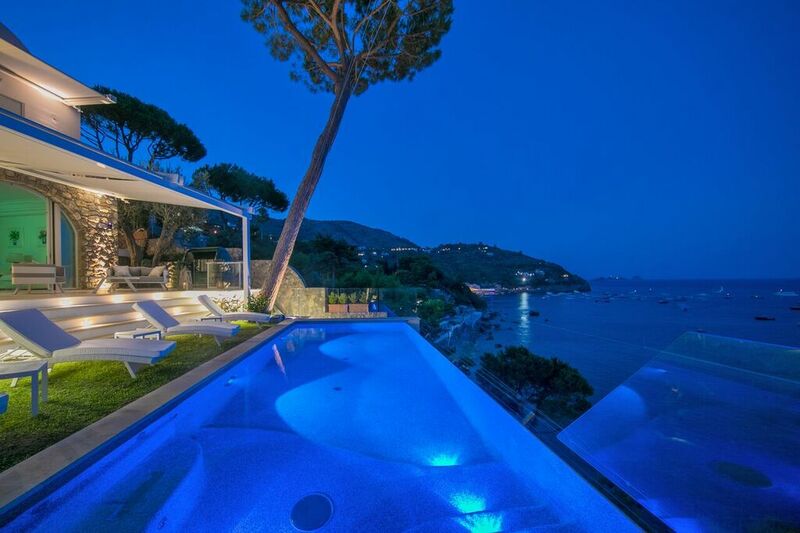 It is spacious and very panoramic. The bedroom has a double bed, 70” Sat TV, air conditioning and heating. The bathroom has a large shower, mirror and hairdryer. 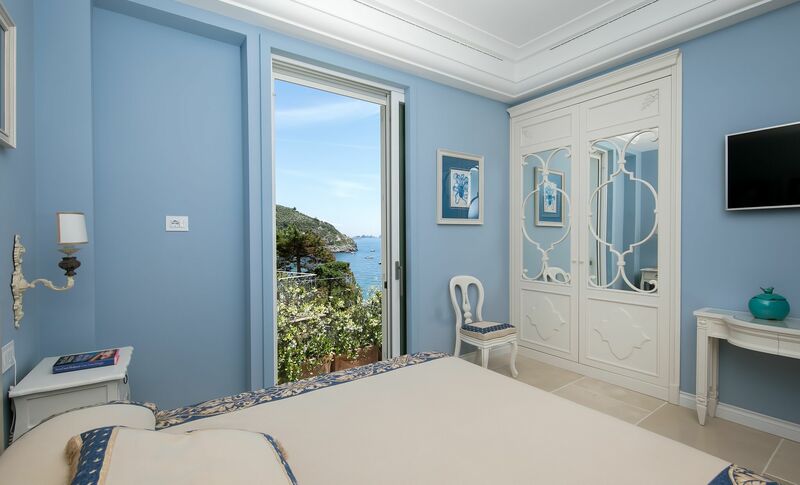 The bedroom leads out on to a beautiful terrace with sea views and is accessed from either the corridor or the terrace. There is a guest bath and laundry room with washing machine, iron and ironing board on this floor as well. The laundry room is accessed from the corridor. 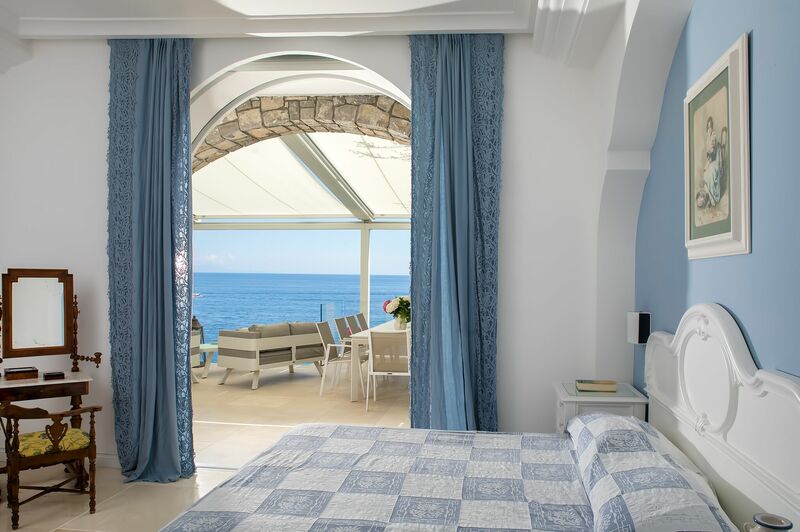 Spacious terrace with flowerbeds leading to three panoramic bedrooms, all offering great sea views and tastefully furnished. 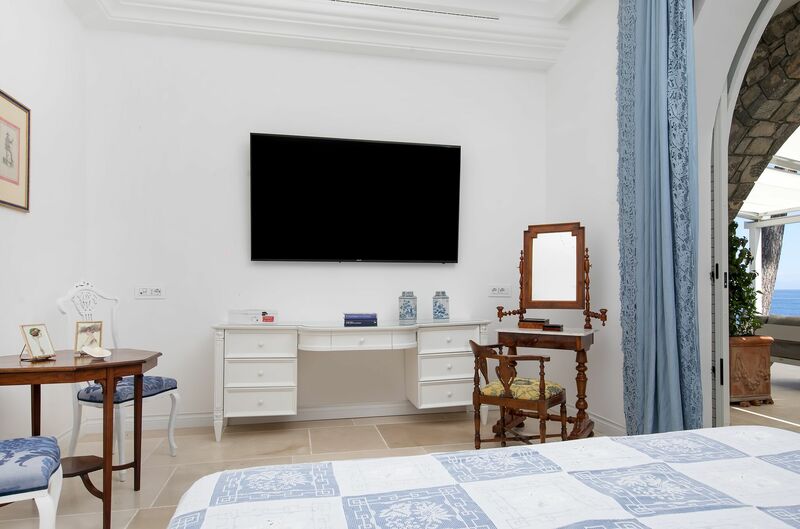 The second bedroom with en suite bathroom has a double bed and a single bed, Sat-TV, safe, minibar, air conditioning and heating. 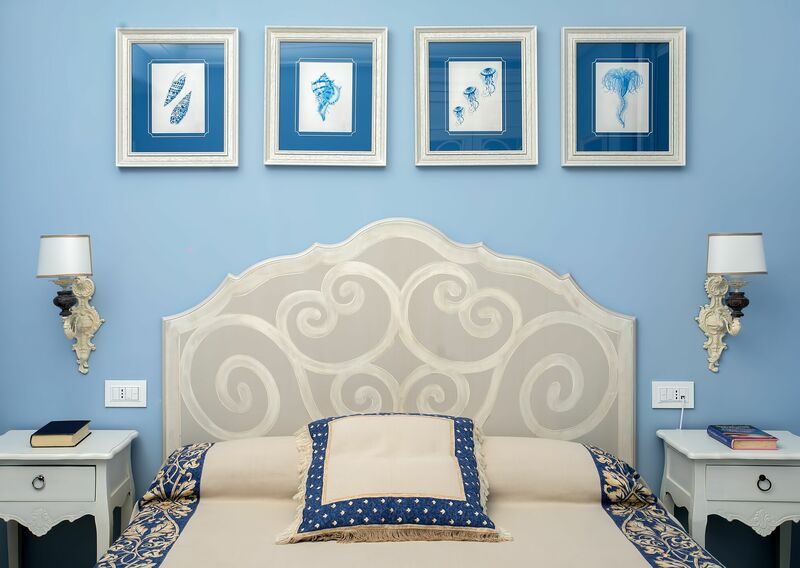 The bedroom leads on to a spacious balcony with a spectacular sea view. 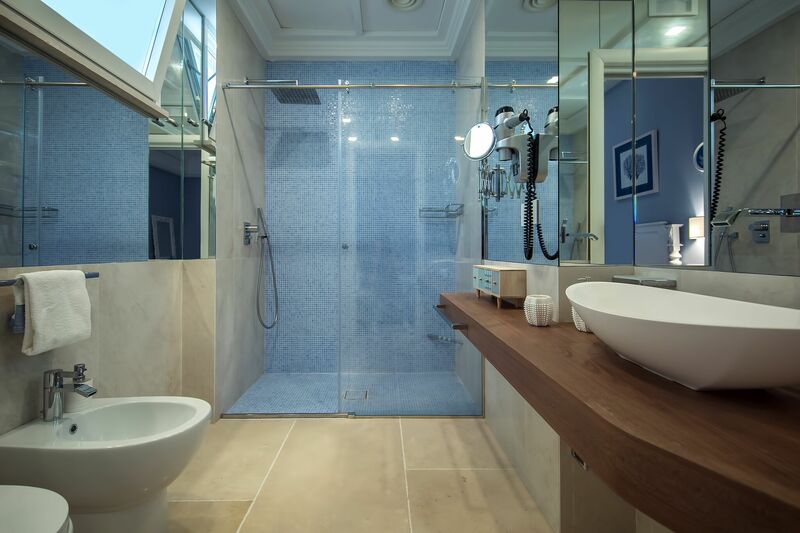 The bathroom has a large shower, mirror and a courtesy line furniture. The third bedroom with en suite bathroom also has a double bed and a single bed, Sat-TV, minibar, safe, air conditioning and heating. 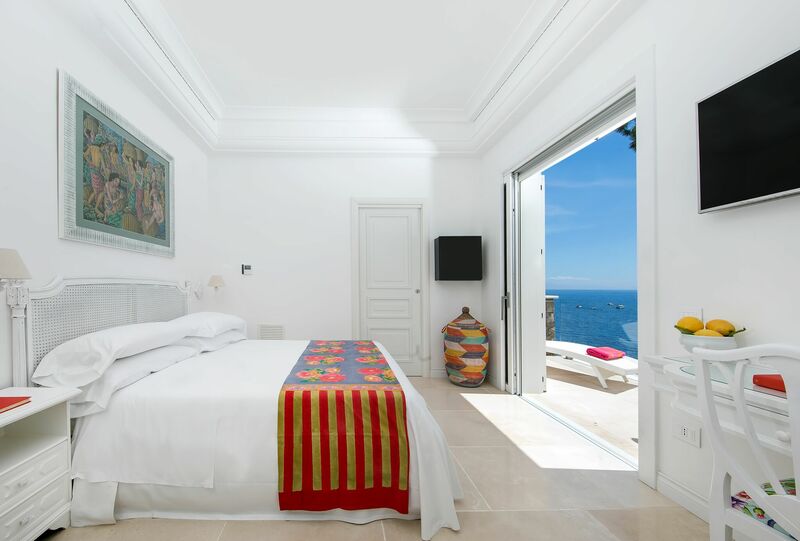 The bedroom leads on to a beautiful terrace with a spectacular sea view over Li Galli Island. The bathroom has a large shower, mirror, hairdryer. 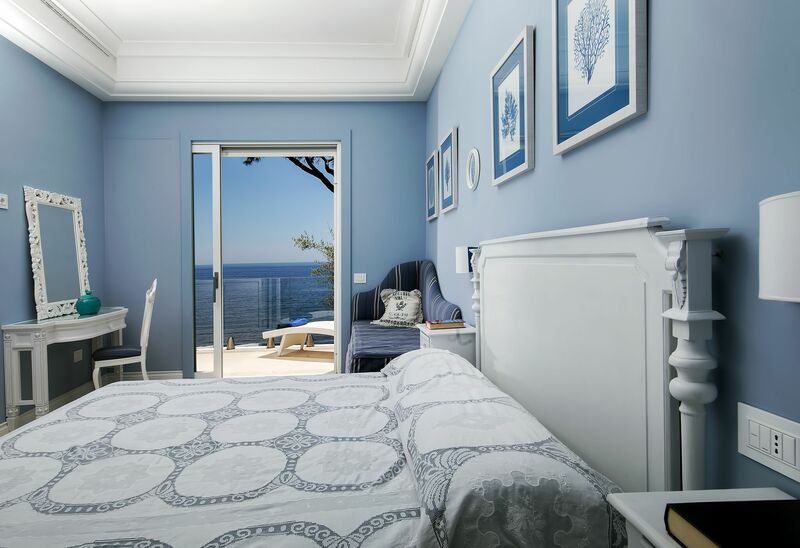 The fourth bedroom with en suite bathroom has 2 twins convertible on request in a double bed, a balcony with a magnificant sea view, Sat-TV, minibar, safe, air conditioning and heating. 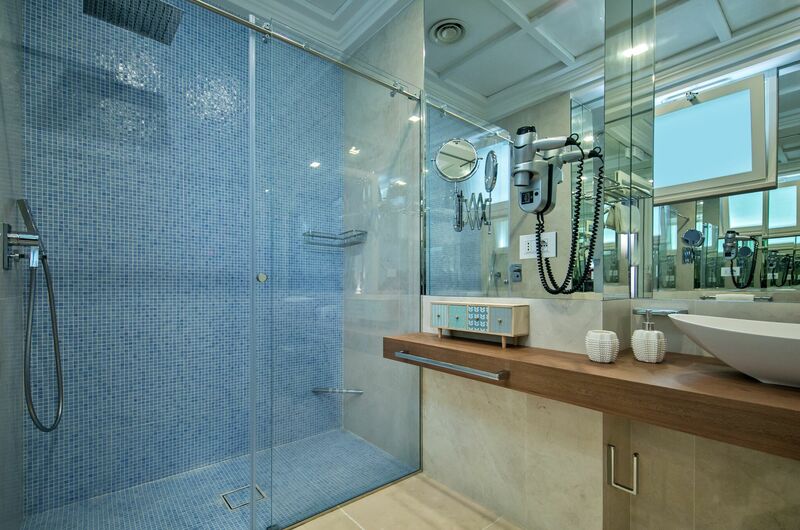 The bathroom has a large shower, mirror and hairdryer. Located on the first floor, the depandance is accessible from a panoramic lift. 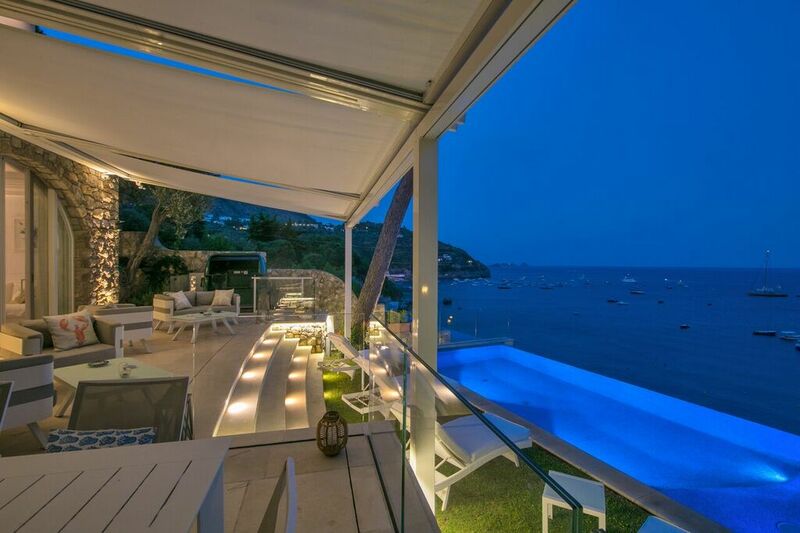 It offers 2 bedrooms with a wide terrace with a spectacular view. 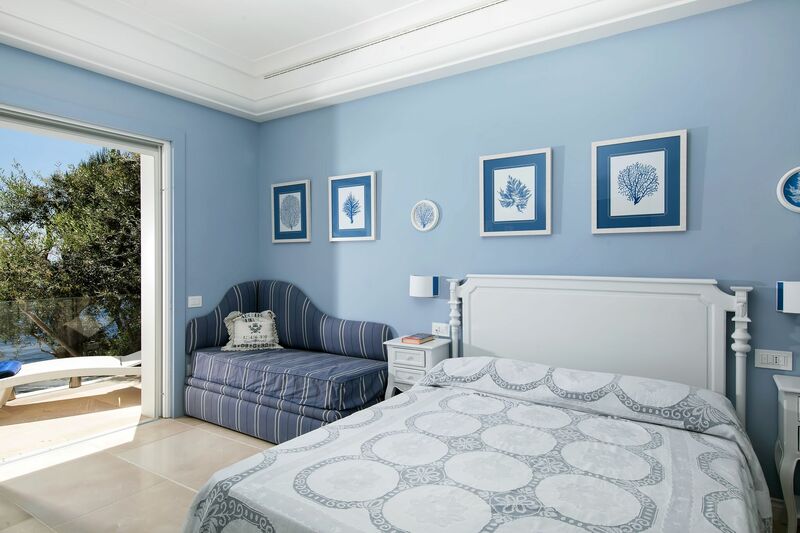 The fifth bedroom is a double with 2 twin (not convertible in 1 double) and an independet access to the terrace. 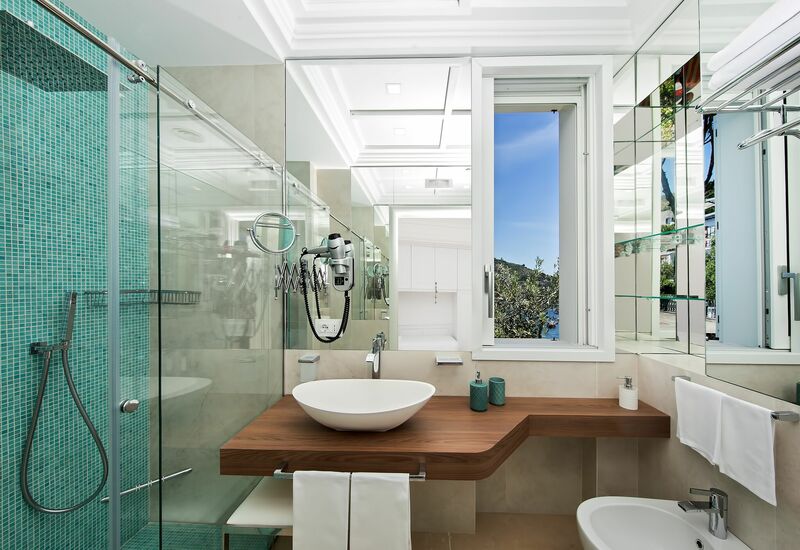 The en-suite bathroom has a large shower, mirror and a courtesy line furniture. 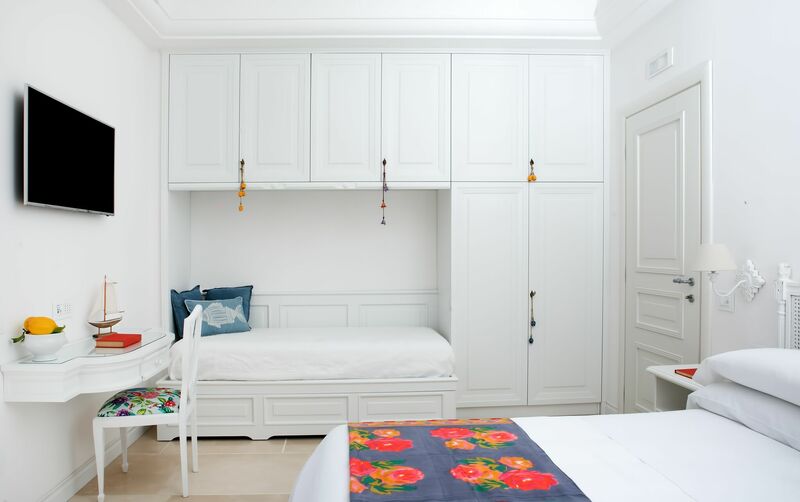 The sixth double bedroom has an independent access to the terrace. 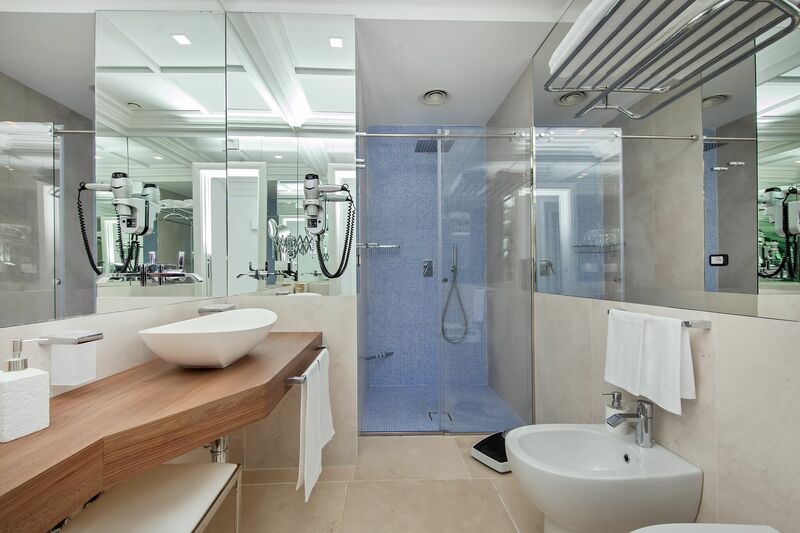 The en-suite bathroom has a large shower, mirror and courtesy line. 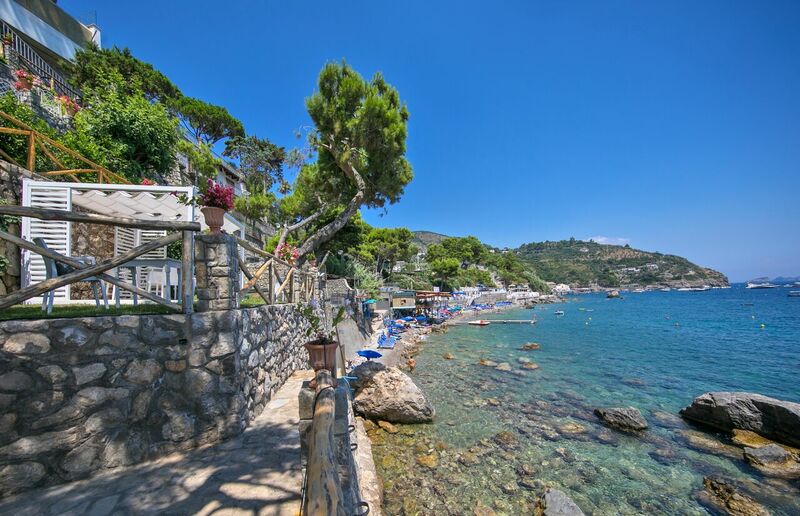 The beach can be reached using a private cable car or by taking a pleasant panoramic stroll, through the various terraces along the convenient stone staircase, flanked by panoramic terraces that slope gently down to the sea. The garden, furnished with a gazebo, chairs and sunbeds, allow guests to enjoy the intense greenery of the lawns and the fragrance provided by the many luxurious and colorful flowers that grow here. 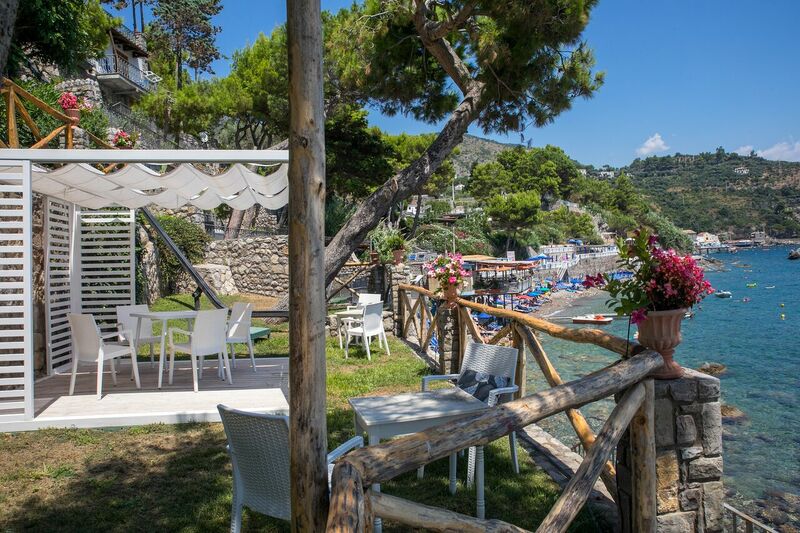 Guests staying at Villa Nereide can also use the services of the adjacent beach club. 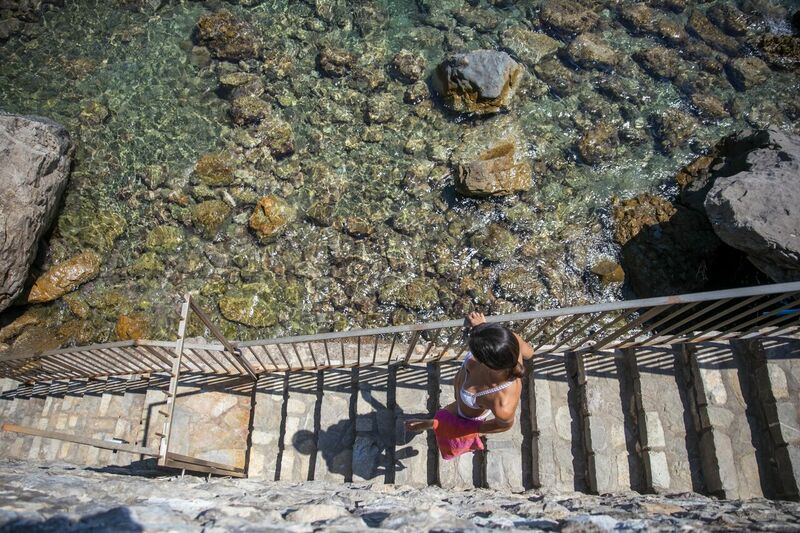 The panoramic swimming pool (3.90 meters x 9m x 1.20-1.70 meters deep) drops straight down to the sea and is boasts a with hydro-massage too. The green lawn border around the pool has sun lounge and features a heated outdoor shower. 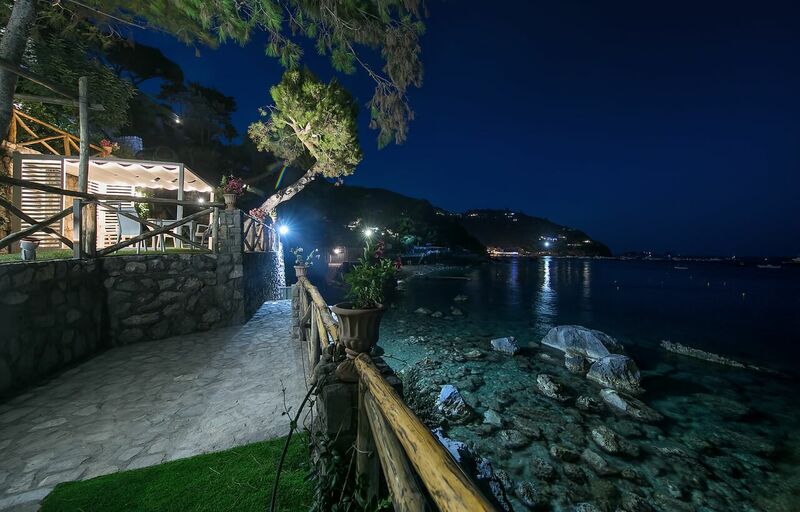 Enjoy a spectacular view of the sea, the village of Marina del Cantone and the Galli islands from here. The swimming pool can be accessed from the patio in front of the living room, along a wide staircase (only three steps) in beautiful natural stone that lead to the garden. A rental car is not required but guests with rentals can use the private parking area (suitable for 2 cars).